Lucette Bourdin is rapidly emerging as one of the brightest stars in the panoply of new ambient artists that have come along since the start of the new century. Her distinctive musical voice, combined with her well established artistic vision in artforms outside the realm of music, gives her recordings a unique and refreshing flavor ... and more than a little depth and scope. Her latest effort, entitled Timeless Shore, is a beautiful case in point. Essentially a single 70 minute ambient long play, Timeless Shore is available in two editions: the uncut full length version (called the Extended Version), and a shortened edit that communicates nearly as much as the full length piece but in a 'mere' 45 minutes. We love the irony, of course, that this shortened edit of the original piece still fully qualifies as a longform piece even unto itself. A brilliant touch. This is ambient music folks - deep immersion requires some time to achieve. And achieve it she does. We could attempt to describe the music to you here, using lots of adjectives and flowery language, but ultimately we would fail. 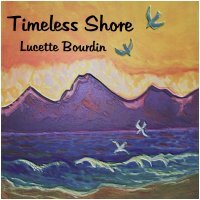 Suffice it to say that Timeless Shore is a masterful demonstration of Lucette Bourdin's brilliant ambient talents, and we would be hard pressed to point to a better release in 2008. So give it a download today. You'll love it; we promise.